Elohim cast the Canaanites out of the Promised Land because of their pagan idolatrous practices. They worshiped Ba’al, or Nimrod, Tammuz, the sun god, the pagan Messiah, the god of wine and revelry. They worshiped the evergreen tree, and used it as a symbol of their god. 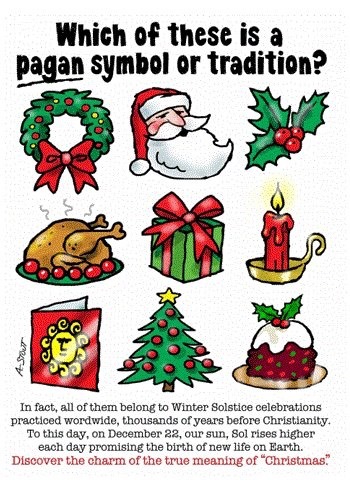 They observed December 25, in worship of the waning sun, and their sun-god divinity. This whole religious system stemmed from ancient Babylon, the root of all heresy and apostasy. Their heathen rituals were particularly displayed during Rome’s mid-winter festival, Saturnalia that we mentioned in Part II. This festival included gift-giving, drunkenness, gluttony and sexual licentiousness. It seems to be pretty clear from the Scriptures that no matter what our intentions (as in “God knows my heart”), Elohim does not want to be worshiped in the same manner as pagans have worshiped their gods. He forbids it and the Israelite’s were punished for these acts. I am not sure there is much else that can be said if these verses are not clear except I wish to reiterate that Elohim does not change – “For I am the Lord, I change not.” Malachi 3:6. So, certainly how He felt back then about this false worship is how He still feels today. Below is a video that has excellent information regarding the pagan roots of Christmas and how it is used in the Occult. This series is taught by Doc Marquis who is a former witch who grew up in an Illuminati family, so he knows these things to be truth from first hand, personal experience. I would recommend anyone to watch this entire series if searching for the truth and to understand some of the occult concepts he references, but the one linked below is specifically about Christmas. When we celebrate Christmas as a holiday (holy day) for Messiah, what are we doing? Let’s take a look at some of the common items used when we celebrate “Christmas” as a holiday dedicated to the worship of Messiah. Again, this is just scratching the surface of the information that can be found when one truly desires to seek the truth. Let’s also take a look at the name Santa – S-a-n-t-a, it looks very similar to the name Satan, S-a-t-a-n. Could Santa be the creation of the evil one to deceive the world and cause children (and adults alike) to love an omniscient, omnipresent, eternal, benevolent being which the belief of Santa claims. Instead of the true Omniscient, Omnipresent, Eternal, Benevolent King who is Yahusha, the Messiah! Definitely something to think about. Let’s also touch on another one of Santa’s names, Kris Kringle which is ironically derived from the word Christkind, who is an Austrian and German gift-giver, and means “Christ Child.” I find this to be blasphemous to our Messiah and Savior. Evergreen trees have been used in pagan worship since the beginning of time and is one of the most pervasive customs of Christmas today. As Christians, we oftentimes believe that the tradition of gift giving on Christmas is in remembrance of God’s gift to us, or the gifts the Wise Men gave to Christ. In actuality, the tradition dates back to the Roman festival Saturnalia, where revelry and debauchery took place to honor their sun god. It seems clear by these things we read above, that human tradition rooted in pagan religion has become entangled with scriptural truth. Again let’s turn to the Scriptures to find what Elohim, the one true God thinks about human tradition? “Ye hypocrites, well did Isaiah prophesy of you, saying, ‘This people draweth nigh unto me with their mouths, and honoreth me with their lips; but their heart is far from me. But in vain do they worship me, teaching for doctrines the commandments of men” Matt. 15:7-9. In Acts 15:20, the Apostles were writing to the Gentiles who had become Christians to abstain from things polluted by idols, from sexual immorality, from things strangled, and from blood. Friends, we are the temple of Elohim and we are told to abstain from idol worship, not “redeem or rename” this pagan “Holy day” as I hear a lot of Christians saying we can/should do with Christmas. We absolutely can NOT keep Christ in Christmas if He was never there to begin with. It should be clear that we can NOT redeem a holiday rooted in false pagan worship that was simply deemed the birth day of our Messiah by man in order to worship our Savior on this day! Even back in 1647, the puritans while aiming to honor Elohim with the pure gospel and not traditions of men banned the observance and celebration of Christmas. It was in fact illegal in Massachusets, as they made their way into America until it was re-instituted in 1820. Please watch this video for more information here – Why was Christmas Banned in America until 1820? Messiah tells us here that we will be hated, we should actually expect it from those who do not know Him. His very name invokes fear and hatred from the unrighteous. From this scripture truth, we can gather that the world should hate Christmas, if it is of course truly about the Messiah. But we know this is not so as practically the entire world not only observes this holiday but embraces it. I will refrain from posting the pictures here, but we all are very aware that companies and organizations that do not hold to Christian values but instead embrace the world advertise and promote “Christmas”. Companies like Starbucks and Target who not only make sure anything considered Christian is not associated with their company, but actually promote many ideas that are completely contrary to the word of Elohim. Ok, at this point some will say that the world has distorted Christmas just like it does everything else. I hear many times things like “We must take it back!”, “We must redeem what the enemy stole and turn it for good!” Frankly, with the truth I have found in the history of these false pagan religions and in the Holy Word of Elohim, I say we CAN NOT do that. In fact, what I believe is that…. The world openly celebrates Christmas because it was never of Messiah to begin with. Christmas was of the world from the start. If the word Christmas, or the actual holiday was actually of Messiah, then the world would hate it. As followers of Messiah, we have been called to be set-apart from the world in numerous scriptures. We are considered righteous and a holy priesthood because we are the children of our High Priest, the Messiah. If the world adores and celebrates Christmas and all of the materialism and greed that comes along with it, why would we as Set-apart ones want to follow them? So, it’s time to answer that question I asked myself in Part I. When I first realized the truth about Christmas and I grieved the thought of not celebrating, I had to ask myself WHY? Why would I miss it so much? Was it truly because I couldn’t worship the Savior if we didn’t celebrate it? What is because I though Messiah would disapprove if we chose we would no longer celebrate what the WORLD says is the day He was born? The tough but true answer is NO! I would not miss celebrating Christmas for any of these reasons. I grieved because of the memories, the good times had by family and friends around this time. I grieved because I absolutely LOVE to give gifts to my family and friends and I would miss doing this during the Christmas holiday season. I grieved because I would miss the smells, feel and sounds of Christmas which bring me full circle back to the memories I have as a child and as an adult. Friends, none of these things have to do with worship of our Savior. And most importantly, NONE of these things that I grieved by not celebrating Christmas are required to be done ONLY at Christmas time. I can remember those good times with family and friends, they will always remain memories to me and I don’t have to rid myself of them simply because we have decided as a family, that Christmas is not of Messiah and we will no longer celebrate it. Instead, we will choose to give to family and friends throughout the year. For no reason or even for a good reason…we do not need a holiday tradition, rooted in paganism and established by man to give to others. We should be doing these things and giving daily, with love. Let me ask you (as I asked myself), what if Christmas didn’t include presents, trees, lights, songs, wonderful food, Santa Claus, candy and family gatherings? Would we still be as dedicated to celebrating it then? Would we fight to keep Christ in Christmas as much as we do now if these things were not a part of the celebration? Instead of getting so excited and focusing on the coming of Christmas, we should have the same excitement and focus on the appointed feasts of Elohim as He instructs in His word. Our family is excited to learn more about how we can honor and observe these feast which point to our Messiah and are actually in the Scriptures, starting next year. We should have the same excitment, joy and abandon as we worship our Elohim and Messiah every single day…every . single . day! Throughout scripture we find Elohim instructing us on how and how He does not want to be worshiped. If we look in the New Testament, we can find verses that shows us what true worship looks like for believers under the New Covenant. In this verse, Paul uses a capital ‘S’ which implies the Spirit of Elohim. As believers, our sin originates in the flesh, and therefore we cannot worship God with “fleshy” things. So, how does this relate to Christmas? If our flesh is satisfied in the sights, sounds, and smells of Christmas, is it truly worship of Elohim which is to be done in the spirit? Our worship should be centered on Elohim at all times. If aspects of “worship” begin to focus on us and what we feel, then it is not true worship. So, the fight to keep Christ in Christmas…what does that really mean? I will ask again, if Christmas did not include all of the festivities we associate with the holiday would we be fighting at all? Is Christianity really fighting to keep true worship in the spirit, the way Elohim commands it in Christmas? If your answer is yes after all you have read here, I must seriously beg to differ! Truly, the whole world has been deceived by the evil one and his cunning masquerades, even since the very beginnings in the garden. The celebration of these ancient pagan festivals, calling them “Christian,” is an abomination in the sight of Elohim and He does not accept it as worship! “If ye continue in my word, then are ye my disciples indeed. And ye shall know the truth, and the truth shall make you free” John 8:31-32. 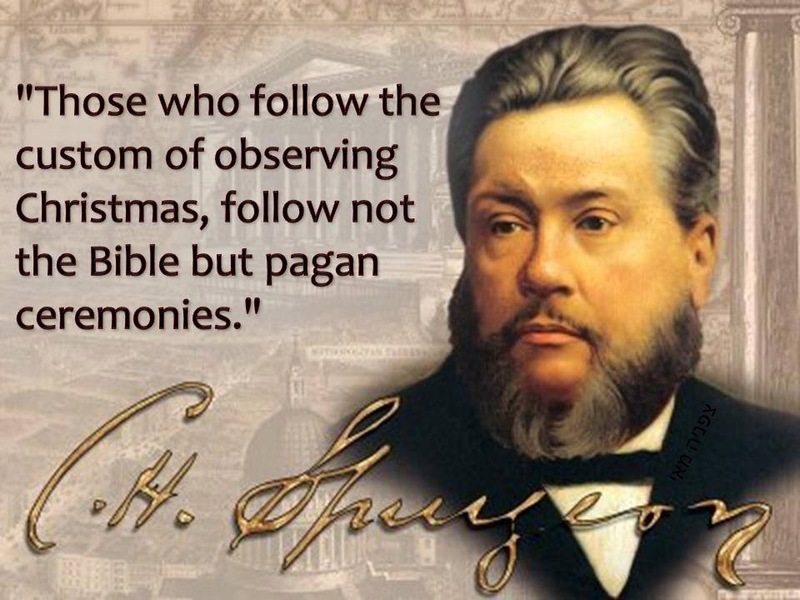 The truth is, Christmas is a pagan and man-made “Holy Day”. The question is, now that you know…what are you going to do about it? May the Holy Spirit of Yahuah (God) help you to see clearly and choose for yourself and your family how to worship Him in spirit and in truth! I have come to the same conclusions around the same time as you have, and have noticed that there are not many but some that are beginning to see these truths in scripture. Unfortunately I am struggling to bring my family to the light of these truths, and also friends that just flat refuse to hear the truth even when you take them to scripture and show it to them in the word.I have left the church (denomination) I have been in all my life and have started a church where these truths are preached and taught. I am about to try and become a pastor of a church that is established and pray that they will hear truth and will allow me to point them to the truth of the word so that they may be led out of the deception that is called christianity in the church today.